Hey everyone! I'm still here, I just took a bit of a blogging break. It goes in cycles, I think, where sometimes you'd rather just bake, cook, and eat without thinking and taking pictures. I don't really like to go too long without posting because then it becomes a habit. I did, however, take some pictures from a restaurant I checked out recently. I haven't heard of it before, though it's locally owned and and different from most restaurants in the South Bend area. 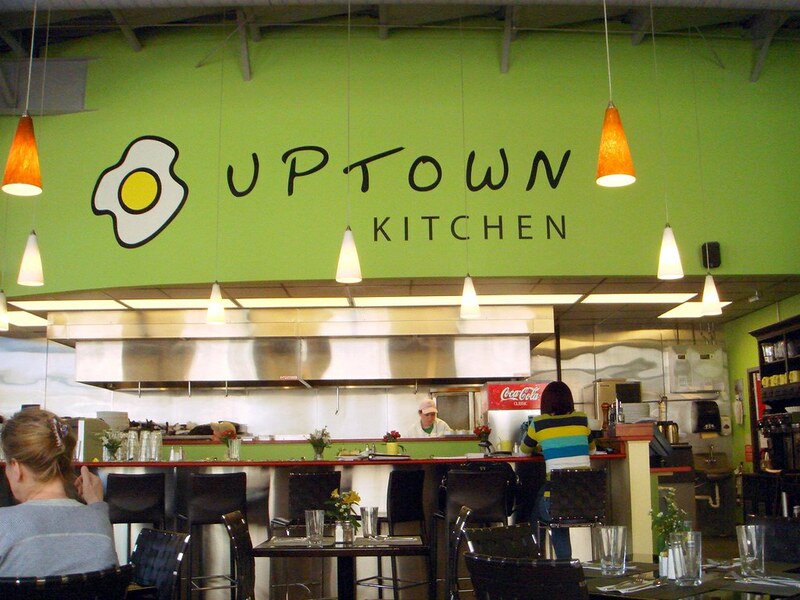 Uptown Kitchen features a menu created with fresh, quality ingredients, nonprocessed meats, and tons of flavor. The owner, who came from Chicago, dreamed of having a restaurant since he was 10, and I'm glad I got to eat here! Serving breakfast all day, the menu offers creations that aren't typical of many breakfast fare served elsewhere, as well as a lunch and dinner menu with offerings for everyone ranging from a Kobe beef burger to a protein-packed quinoa burger. The ambiance is an eclectic, fresh vibe that you can feel instantly upon entering. It's like dining in a really awesome dining room, but in a public setting. The hanging lamps lead up to an exposed ceiling that only lends to the eclectic feel, and reminded me of the cafe at Fox & Obels. Windows surround the entire dining area and off to the side is the kitchen, of which you have a complete view. I love eating with natural lighting as it just gives everything a brighter, lighter feel. Before I talk about what I ate, I'll first tell you a bit about the coffee, of course. 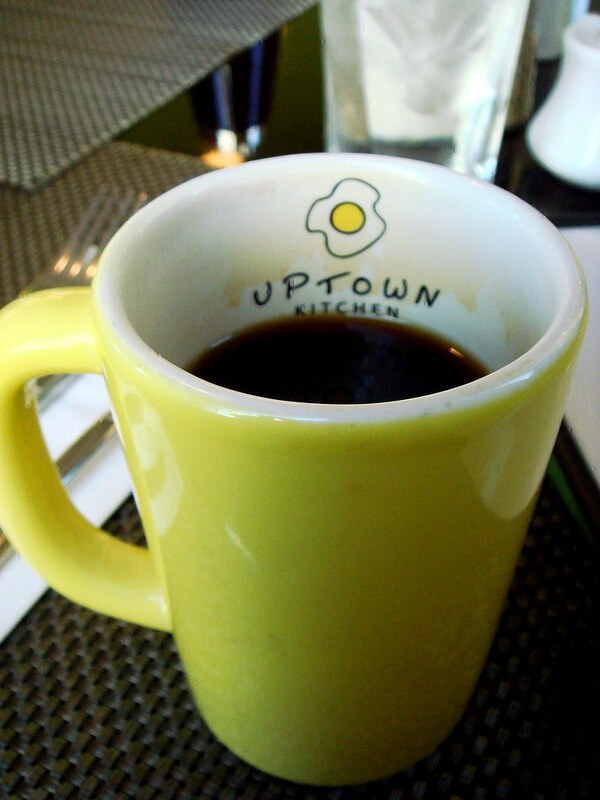 Uptown Kitchen offers two roasts, a Brazilian and an Ethiopian. The former is the lighter roast of the two, yet it's not weak at all. It has a fruitier, brighter flavor that I felt complimented the tastes of the dishes I had better than the Ethiopian, which to me was richer, but almost tasting reminiscent of a Starbucks roast (ew), yet not. It didn't have a caramelization of the oils and flavors that I look for in darker roasts. We had a challenge when it came to deciding what to eat, so we made the brilliant choice of choosing two dishes and splitting them. 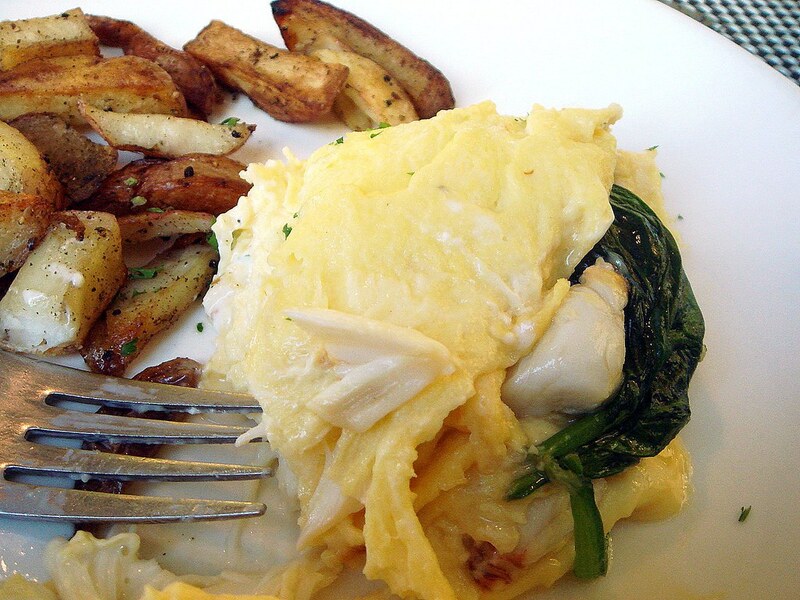 First up was the deliciously described omelette filled with crab, cream cheese, and spinach. It sounded unique, and the combination of ingredients stood out amongst the rest. (If I remember correctly, this was one of the specials of the day.) The order came with a side of their Uptown Fries, pan-roasted and seasoned red potatoes. Was this the best omelette I've ever had, or what! 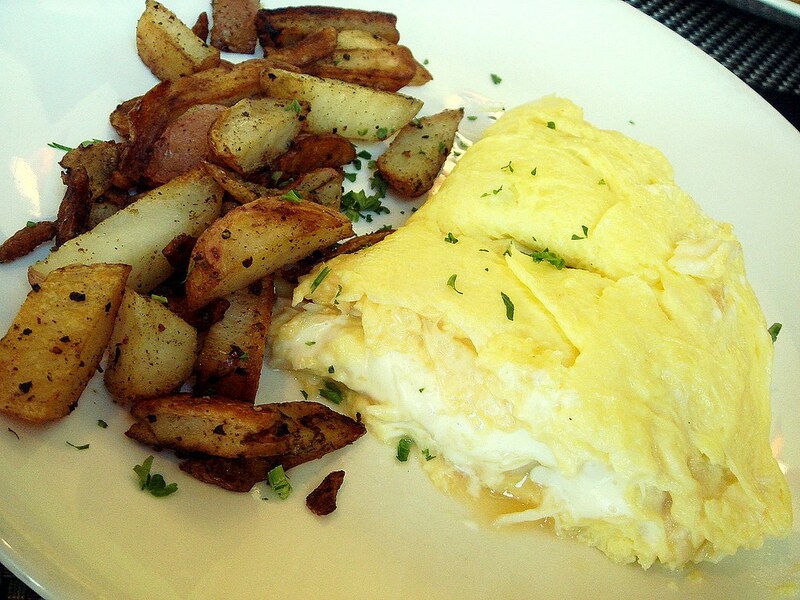 The taste of the cream cheese complimented the crab perfectly, and the texture next to the eggs was great. Sometimes I feel cream cheese can have too much of an overwhelming flavor, but that wasn't the case here. They weren't stingy with the crab, either, which was nice to see. The potatoes were good, and not greasy at all (I was told they use minimal oil, they don't have a deep fryer), though one of the flavors, I think it was sage, tastes off at times. The texture was crispy on the outside, and had the innards of a fluffy, warm potato, and that made it better. Our "dessert" was a split order of lemon ricotta pancakes with raspberry creme fraiche, another special of the day. The pancakes had a very bright lemony flavor, and the texture of the pancakes was sort of like light cheesecake-meets pancake. 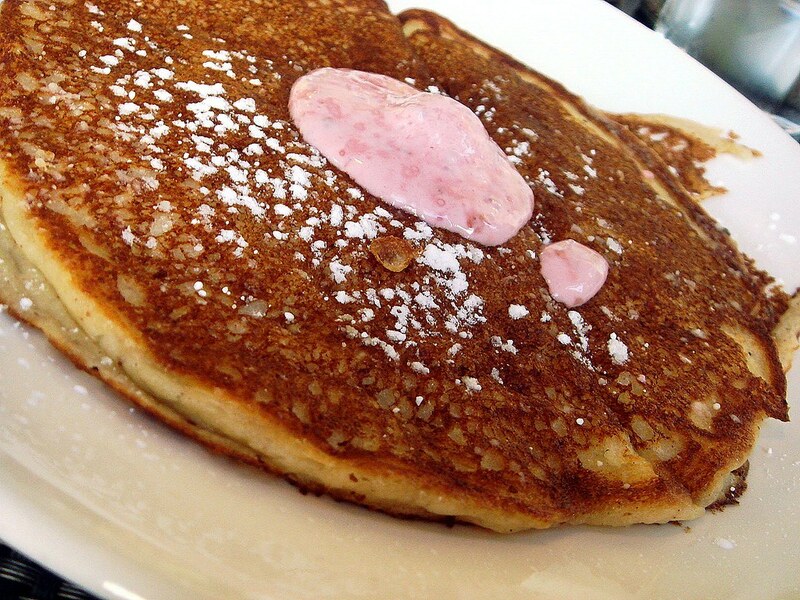 Raspberry always compliments lemon, and definitely made the pancakes with a little extra syrup, too. My next visit to Uptown Kitchen will be solely for the purpose of tasting some of their cakes, like champagne raspberry, and pies. If you're in the area, check it out! What a cute breakfast spot! It really does have a nice, bright-looking atmosphere! I wish we had something like that here, but alas, nothing is cute in Champaign. It looks like a neat breakfast spot! I know what you mean about going in cycles. Sometimes I don't necessarily want to cook/bake something just for the blog. IF I ever find myself in the Indiana area, I will be making a stop here!! Everything looks so yummy!